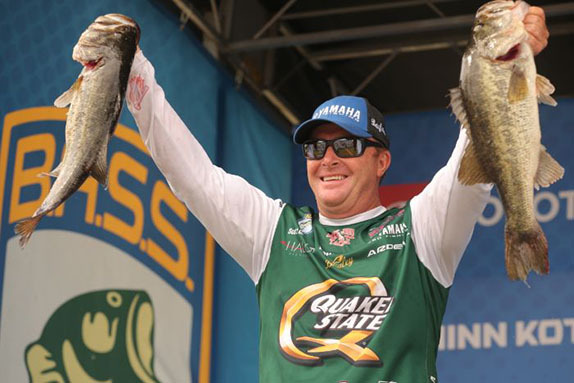 Jared Lintner earned a ticket to the 2019 Bassmaster Classic with his win at the Opens Championship. Jared Lintner didn’t want to have to rely on the Bassmaster Classic Bracket tournament as his means of qualifying for the 2019 Bassmaster Classic. So he took care of business at the Bassmaster Opens Championship. Lintner, who’d finished 41st in Elite Series Angler of the Year points, was slated to be one of 16 anglers in north Georgia this week for the Classic Bracket at Carters Lake. With three Classic berths up for grabs there, Lintner’s odds would have been better than they were at the 28-man Opens Championship last week at Table Rock Lake, but he managed to adjust with the changing conditions and claimed the win with a three-day total of 37-00. 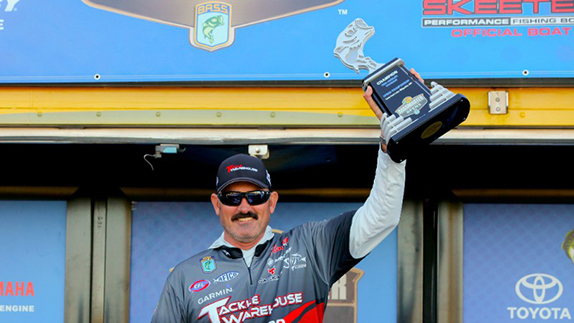 As it stood prior to the Opens Championship, Lintner’s only way to qualify for the Classic was to win it. A runner-up finish wouldn’t have earned him enough points to get into the top 3 in points in the Eastern Division. 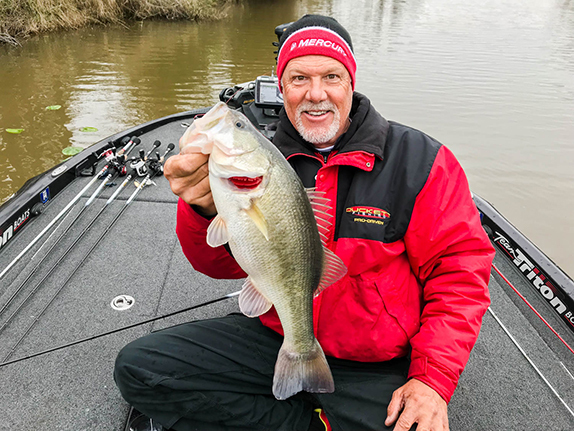 He carried a win-or-else mindset into the tournament, a tough task at Table Rock during the fall transition, but he managed to generate the right kind of bites with a jig and crankbait to close the deal. Ultimately, smallmouth carried Lintner to victory as 14 of his 15 weigh-in fish were of the brown variety. It did, and here are some additional details about how it went down. In two Elite Series events at Table Rock (2006 and 2014), Lintner scored top-20s both times. He started practice on topwaters and had a couple bites, but couldn’t generate anything consistent. He switched to crankbaits, which had served him well there before. Lintner also flipped a ¾-ounce jig around cedar trees. He generated some bites, but it seemed to taper off as the weather changed. Coming out of practice, Lintner had a slew of options to start the tournament. He wound up focusing on the part of the lake between Kimberling City and Long Creek, where the field blasted off from. He caught three smallmouth in the first hour, but went until 11:30 a.m. before catching his fourth. “I was like, ‘What is the deal,’” he quipped. He finally finished his limit, then culled a couple times with the jig to tally 12-14 with one of just 10 limits recorded. With rain and much cooler temperatures rolling in for day 2, the fishing improved. Lintner caught roughly two dozen keepers, mainly on a crankbait. He mixed in a spinnerbait and tried to adjust to the conditions, but it wasn’t a “call your shot” sort of scenario, he said. His 13-03 stringer boosted him into 2nd place behind Caleb Sumrall. He caught a limit in the first hour of the final day and figured with the post-frontal conditions, the jig bite around the cedar trees would be a viable options. They produced one bite so he resorted back to the crankbait. “With the wind blowing around 1 p.m., I thought they’d bite that,” he said. “I never had a bite. I changed colors and retrieves, but never got them to bite. I felt like I was letting it slip away. 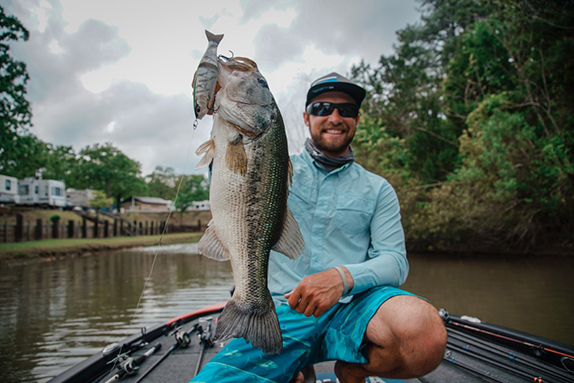 Entering the final day, Lintner figured a 13- or 14-pound bag would keep him on Sumrall’s heels, but he was certain another of the 12 finalists would come in with a big bag in the 17-pound range. In reality, he was putting the finishing touches on a Classic berth. > Lintner said the deepest he fished all tournament was around 18 feet, mainly around the cedar trees. He cranked the 6- to 12-foot section of the water column. > Jig gear: 7’5” heavy-action G. Loomis GLX flipping rod, Shimano Chronarch G casting reel (8.1:1 ratio), 22-pound Sunline Shooter fluorocarbon line, ¾-oz. homemade pitching jig (camo craw), Strike King Rage Tail Bug trailer (blue craw). > The jig Lintner used was poured by fellow pro Terry Scroggins. > Cranking gear: 7’2” medium-heavy Shimano Expride fiberglass casting rod, Shimano Metanium MGL casting reel, 12-pound Sunline Cranking FC fluorocarbon line, SPRO RK Crawler (phantom brown), Jackall MC-60 (custom color). > Lintner swapped the front hook on the SPRO crankbait for a #4 Lazer TroKar treble.